Business Travel News has built up a reputation for featuring a cruise in the edition that covers the end of year holiday period. What you are about to read stays on the website until Sunday 5 January (and is then in the archive). In 2012 we featured Silversea Spirit and this time around it is Swan Hellenic’s Minerva in the Caribbean, including for the first time Cuba. Last year it was the American way of a seaborne holiday, and this time a very British offering, both extremely different, but each one just as enjoyable. Swan has been around a long time, first established in the 1950s offering educational cruises around the Greek islands. Sir Mortimer Wheeler, the archaeologist, was employed as guest lecturer. In that sense nothing has changed except that the company’s present ship Minerva roams the entire world. Most cruises carry four or five guest lecturers to cover several disciplines appropriate to the cruising region and the ports visited. 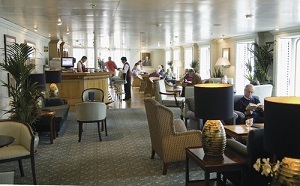 They give 40-minute talks during the time at sea, and if there is an entire day of cruising, there will be three or four talks to concentrate on in the Darwin Lounge. Attend as many as you fancy. The land programme, part of the package, complements the lectures. Today Swan is part of All Leisure Group Plc which also includes up-market tour operator Page & Moy, and even more up-market Hebridean Cruises. The tiny 50-passenger Hebridean Princess has been chartered by the Queen at least twice for her summer vacation and is the only cruise ship to display a ‘By Royal Appointment’ badge. Voyages of Discovery, and Voyager, is another part of the group. Minerva, the subject of this review, has not been honoured in transporting Her Majesty but she would not feel out of place on a ship that is a true floating country house hotel. Minerva is not a larger Hebridean Princess but is up-market in a very British way. Both the company and the ship have interesting histories. Swan (the nickname Swanners is used to describe returning passengers – often as many as 70% of clients on a cruise are repeats) was purchased by the then British company P&O in 1983, itself taken over by America’s massive Carnival Corporation in 2004. Minerva was laid down in 1989 with an ice-strengthened hull as a Ukrainian spy ship but was towed unfinished to an Italian yard and completed as a 350-passenger cruise ship. 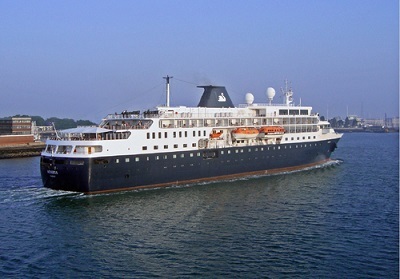 It joined Swan in 1996 and became very popular but left the company in 2003 as it was considered too small for an operator that included QM2. In fact Swan did not fit into the Carnival philosophy and in 2007 Lord Sterling, the former P&O Chairman, and a Swanner himself, combined with All Leisure Chairman Roger Allard to create today’s successful operation. 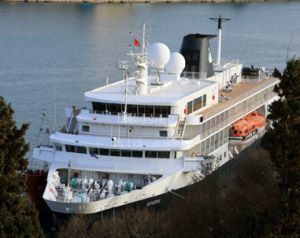 The current Minerva is a 12,500-ton ship that carries up to 352 passengers, double occupancy, on in-depth, cultural itineraries in Northern Europe, the Mediterranean and East of Suez into the Indian Ocean and Southeast Asia. In early 2012, the Minerva received a multi-million pound, 83-day refit. During the overhaul she added 32 balconies to existing cabins, increasing the number of balcony suites to 23% of all cabin accommodation, a new forward facing observation lounge and bar – the Orpheus Lounge – on the top deck, providing guests with expansive panoramic views. New were a dedicated internet lounge, an extension to the popular Shackleton Bar where guests enjoy pre-dinner drinks, an outdoor walk round the promenade deck (eight laps to the mile) and finally, upgraded en-suite facilities in every cabin. It was a very clever makeover changing the whole image of the ship, the extra balcony cabins secured by turning the existing promenade deck into individual verandas, and roofing them over. In the opinion of most the ship had changed, going perhaps a little more up-market. We now turn to the winter of 2013/2014; sailing into the Caribbean and for the first time, Cuba. As these notes are being written, the Communist state (one of only two still remaining – and North Korea does not welcome tourists) still lies ahead of us, “a challenge” according to Paul Carter, Cruise Director. Most ports visited by the ship are on the world cruising map, but not Cuba. Swan despatched one of its senior tour organisers to check things out well in advance of the visit. These notes were ‘satellited’ to BTN’s new publisher, Kelsey Media, well before we entered Cuban waters. John Dew, a former British Ambassador to the Castro dictatorship, and a lecturer on the cruise, does warn that wi-fi communication is not guaranteed. Most Swan cruises are generally unique and not repeated. Minerva can get into ports and anchorages not accessible to larger ships. Your Editor (and wife) joined Minerva for a pre-Christmas Caribbean cruise starting at Barbados and routing via St Lucia, Antigua, Turks and Caicos, and the Cuban ports of Santiago, Havana and Casilda, completing at Montego Bay (Jamaica). The cruise is 16 nights on the ship; the majority of passengers transferred from Gatwick by a special Virgin Atlantic A330 charter on its official departure day. Life was made very easy at Gatwick by using the excellent APH Meet and Greet service. Quite frankly for the little extra cost it takes the hard work out of the car to terminal transfer, particulary if you have luggage. BTN went out three days early staying at the very fine Cobblers Cove hotel on the coast, 25 miles north of the capital Bridgetown. We will review the flights, hotel, Barbados and the other ports of call at an early date, suffice to say that first impressions count. Pre-cruise we received a splendid illustrated 68-page book telling us just about everything we wanted to know regarding the trip, including all the tours. It is a first class and most useful product. At Gatwick for the scheduled British Airways flight, with just 27 early arrival passengers booked, a Swan representative was on hand “just in case”. 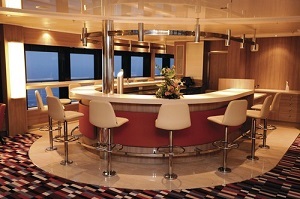 Minerva’s officers are European, the cabin stewardesses Ukrainian and the restaurant and bar service personnel Filipino. It is an all-in package from the time you arrive at an airport (for an overseas trip) until your final disembarkation. There are no service charges and the off-ship excursions are included. A chauffeur car is provided for the top suites and for the formal dinners wine is included. 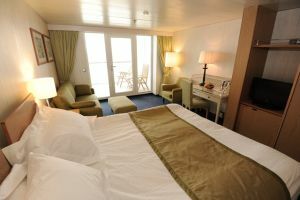 The ship is comfortable rather than lush, and the opposite of the mega size cruise liners. Children are not encouraged. Price-wise Minerva is not the cheapest, but what it offers is very good value. Dining is three or four courses (or even five if you want them), with a fine mixture of British, continental and eastern dishes. There is a choice of two eating places with much the same menu in each. A specialist company, Seachefs, provides the skill for this very important area of the whole trip. With the Swan Restaurant it is jacket and tie virtually every night. Less formal is The Veranda which opens out to an open deck poolside area over the stern. There is an extensive wine list including a special Rothschild selection. Breakfast and lunch are served in both venues, and there is also a full English afternoon tea. Tea and coffee are on hand 24 hours; a continental breakfast is available in your cabin, as is a comprehensive room service menu at no extra charge. The maitre d' asks if you would like to join others, start a new table or dine alone, so the arrangement is ideal for solo travellers. You may arrive at any time between 19:00 and 21:00 for dinner, though most will be seated by a little after 20:00. There is no photographer on board, nor art auction or casino, but the Ocean Spa does offer a beauty and wellness service and massage. The gym is small, never busy and has the latest equipment including flat screen TV units to help pass away the time. A free passenger laundry with washing machine, dryers and ironing boards is located on the Aegean Deck. A laundry and pressing service is available. There is full time medical cover with a well-equipped centre and a doctor and nurse available at any time. Clinic hours are noted for non-emergency calls. “Britain Today” is distributed to every cabin. Accommodation is one area that received a lot of attention in the refit. There are now 44 cabins with balconies on the refurbished ship, portside with bath tubs and those on the starboard side with rather nice large glass enclosed showers. The remainder with sea view have windows or, on the lower decks, portholes. There are 46 inside cabins, and four cabins across all grades equipped for wheelchairs. Certain cabins are designated for single use, depending on demand, as Swan carries solo passengers. Standard- and superior-grade cabins average 140 to 162sq ft (13 to 15sq m), while the deluxe cabins and suites measure 226sq ft (21sq m). All cabins come with mirrored vanity units and chairs, adequate drawer and hanging space, safes, mini-fridges, telephones, bathrobes, hair dryers and binoculars, as well as complimentary mineral water. In-cabin TVs show BBC, Sky News, in-house programming, replays of onboard lectures and films. Voltage is 220 with British-style, three-prong sockets. All bathrooms and soft furnishings were replaced in the refit, creating a more contemporary, luxurious feel. Because lecture programmes are Swan's great strength, cruise-ship entertainment is limited but of high quality, catering for most tastes bearing in mind that the average age of the passengers is higher than the norm. The Caribbean cruise featured Tuxedo Class, a superb long established four piece roup. Canteremo, slightly more classical. Beatles to Bach with ease. 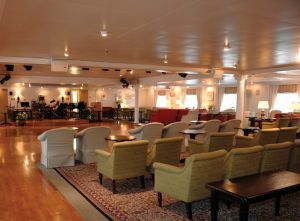 Martin Blackwell entertains in the Shackleton Bar every evening. The Main and Bridge Decks are the hubs of passenger life on Minerva, housing nearly all of the public spaces. 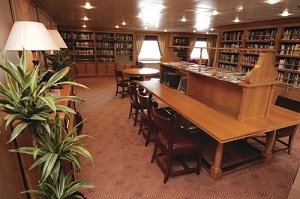 One of the outstanding features is the inviting long gallery library on the Bridge Deck, very possibly the largest such space at sea, vying with Cunard's Queen Mary 2 for sheer number of books. This spacious, panelled room offers open book shelves, comfortable wing-back chairs for reading and the occasional catnap, a reference-book table with space for opening large atlases. The lecturers' spouses serve as the librarians, returning borrowed books to their proper shelves. The puzzle table is the site of much activity, and passengers typically finish a puzzle in two days before embarking on a new one. On the same deck, next to the library on the port side, is the card room. Its seven tables are often filled with bridge-players, and instruction in the game is offered onboard. The six-station Internet lounge is just forward of the Wheeler Bar, having been moved from the library. Internet charges are: £2.50 for 30mins; £4.40 for one hour; £12.60 for four hours and £21 for 12 hours. Personal laptops, iPads and iPhones will all link up. Passing the Caribbean islands, often quite well offshore, it is possible to pick up the local telephone provider, much cheaper than via the ship’s system. A small boutique and sundries shop on the Main Deck sells jewellery, perfumes, Swan logo souvenirs, essential toiletries and sunscreen. 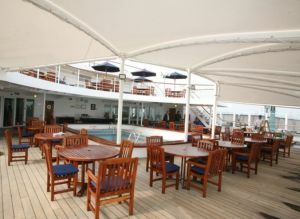 There is ample space for those who wish to sit out on deck and sunbathe. Reserving seats is actively discouraged. Unlike most cruise lines who like to chase their (former) clients off the ship at 0800 for departing Minerva passengers the routine is the same as any day except you loose your cabin at 1000. Even then facilities are made available for a quick wash and change before finally leaving. Great. A port-intensive report will follow in the coming weeks, starting with Barbados and the splendid Cobblers Cove.